Joint operation planning is an adaptive process. Joint operation planning occurs in a networked, collaborative environment, which requires dialogue among senior leaders, concurrent and parallel plan development, and collaboration across multiple planning levels. Clear strategic guidance and frequent interaction between senior leaders and planners promote an early, shared understanding of the complex operational problem presented, strategic and military end states, objectives, mission, planning assumptions, considerations, risks, and other key guidance factors. This facilitates responsive plan development and modification, resulting in constantly up-to-date plans. The focus is on developing plans that contain a variety of viable, flexible options for commanders, and in the case of top priority JSCP tasked plans, for SecDef to consider. 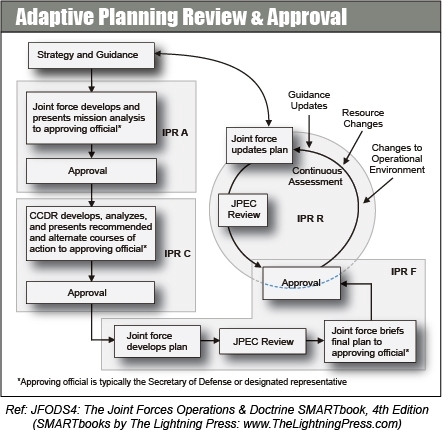 Joint operation planning occurs within Adaptive Planning and Execution (APEX), which is the department-level system of joint policies, processes, procedures, and reporting structures. APEX formally integrates the planning activities of the JPEC and facilitates the JFC’s seamless transition from planning to execution during times of crisis. The integration of joint operation planning with interagency and multinational partners begins with national strategic direction. APEX activities span many organizational levels, but the focus is on the interaction between SecDef and CCDRs, which ultimately helps the President and SecDef decide when, where, and how to commit US military forces. The interactive and collaborative process at the national level guides the way in which planning and execution occurs throughout the Armed Forces. Joint operation planning occurs within Adaptive Planning and Execution (APEX), which is the department-level system of joint policies, processes, procedures, and reporting structures. APEX formally integrates the planning activities of the JPEC and facilitates the JFC’s seamless transition from planning to execution during times of crisis. Clear strategic guidance and frequent interaction among senior leaders, CCDRs, and subordinate JFCs promotes early understanding of, and agreement on, strategic and military end states, objectives, planning assumptions, risks, and other key factors. Based on guidance from this iterative dialogue, planners develop multiple viable options to achieve end states while providing commanders and national leaders flexibility in how they shape the situation and respond to contingencies. Collaborative and iterative assessment and recurring dialogue between commanders and senior national leadership facilitates responsive plan development and modification, resulting in plans that are continually updated. APEX also promotes early, robust, and frequent discourse between DOD planners and their interagency and multinational counterparts throughout the planning process. Joint operation planning provides a common intellectual framework for the joint force, its subordinate and higher headquarters, the JPEC, and DOD leadership from which to adapt to the dynamic operational environment. APEX incorporates planning detail, frequent IPRs, continuous assessment, and collaborative technology, which provide increased opportunities for consultation and guidance during the planning process.